High quality extra fine 200 mesh food grade 1 purification. Thickener, Stabiliser, Emulsifier and foaming agent. Aswell as many other uses. Ideal for making gluten free cakes, bread and doughs. Improves crumb structure, reduces crumbling and improves overall consistency. 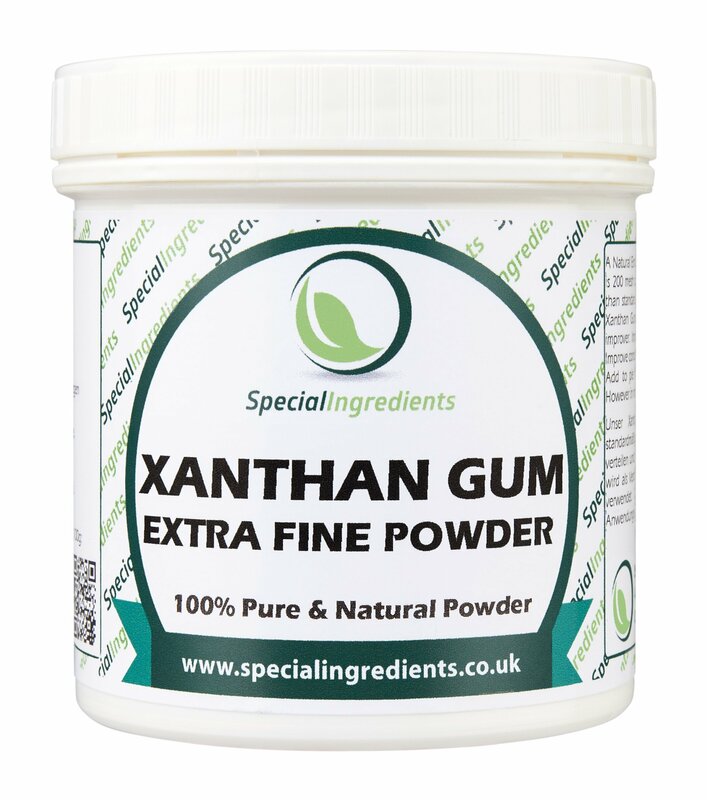 Our Xanthan Gum is 200 mesh compared to the standard 80 mesh this means it is finer than standard Xanthan Gum making it easier to disperse and disolve. Xanthan gum is a food additive and commonly used as a thickener, stabiliser, emulsifier and foaming agent. Xanthan Gum is mainly considered to be non-gelling and used for the control of viscosity due to the tenuous associations endowing it with weak-gel shear-thinning properties. However when added to other hydrocolloids gels can be produced. Xanthan gum can be added to agar agar and kappa carrageenan to form a more stable gel. The consistent water holding ability of xanthan gum may be used for the control of syneresis and to retard ice recrystallisation (ice crystal growth) in freeze-thaw situations. Xanthan gum may be used in pastry fillings, it prevents the weeping of the water in the filling, protecting the crispness of the crust. Xanthan gum may also be added to ice cream to prevent ice-crystals forming. Xanthan gum is capable of producing a large increase in the viscosity of a liquid by adding a very small amount, around 1%, however in most applications it is used at 0.5% or even as low as 0.05% In foods, xanthan gum is most often found in salad dressings and sauces. It helps to prevent oil separation by stabilizing the emulsion, although it is not an emulsifier. Also used in frozen foods and beverages, xanthan gum helps create the pleasant texture in ice creams. It does not change the colour or flavour of foods or beverages. Applications: Stabiliser, Emulsifier and Texture Improver. Use as a thickener, stabiliser and improve texture in sauces and dressing. Add to Agar Agar and Carrageenan Kappa to produce more stable gels. Use in ice cream to improve texture and stop ice crystals forming. Use in pastry and pie fillings to prevent weeping of the filling. Storage Conditions: Dark, Dry and Cool Conditions. Not in direct sunlight. Shelf life of 2 years. A natural ingredient free from diary, cholestrol, gluten, wheat, soya and sugar.